Sossusvlei is one of the most extraordinary places in the Namib Desert; home to the highest sand dunes in the world surrounded by ancient volcanic mountains and one of Namibia's most outstanding features. 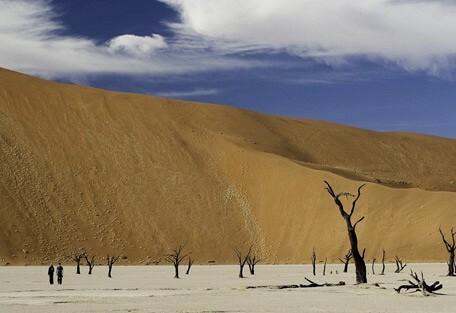 Sossusvlei means 'the gathering place of water' and in good years seasonal rains succeed in reaching the vleis. 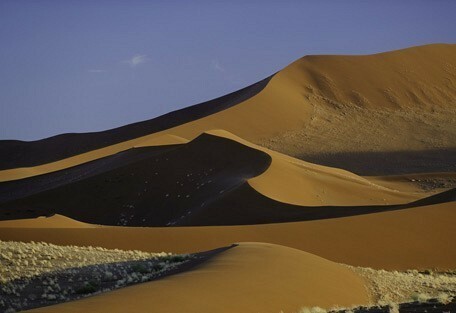 Sossusvlei has the highest sand dunes in the world, perhaps Namibia's most outstanding feature, approximately 1000 feet in height; a 300km by 150km dune expanse stretching from the Khoichab River in the south to the Kuiseb River in the north. Perfectly shaped, blown into razor sharp ridges and peaks by the wind. 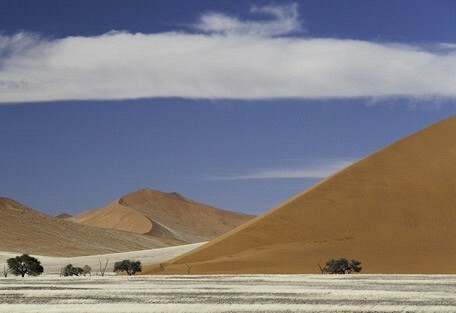 'Big Daddy', one of the world's tallest dunes, overlooks incredible views of Dead Vlei below. Aside from the spectacular scenery and geological fascinations at Sossusvlei and Sesriem Canyon, the area is ideal for observing some of the dune life for which the Namib is so well known. Geologists believe that this magnificent desert, that covers most of the Namib Naukluft National Park, is the oldest desert in the world. Sossusvlei and the Namib Naukluft Park is very popular with photographers. The colours, shapes and contrast of the dunes against the clear blue sky are constantly changing from sunrise to sunset. 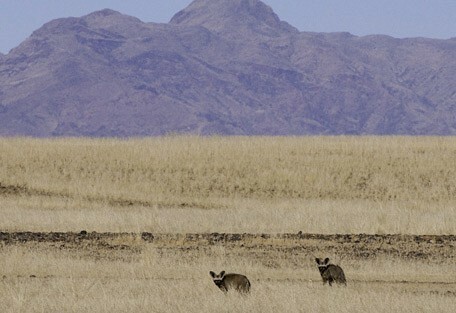 The desert also makes an interesting contrast to a safari and is often combined with Etosha Pan for a safari. Sossusvlei is a renowned stargazing location. The remoteness of this location takes guests right away from city lights and opens up the skies to an abundance of stars. Photographing starry skies is not easy, but this is one place photographers won't need much help. The 'vlei' itself only fills after very rare heavy rainfall when it becomes a magnificent turquoise lake. Apart from the spectacular scenery and geological fascinations at Sossusvlei and Sesriem Canyon, the area is ideal for observing some of the dune life for which the Namib is so well known. Geologists believe that this magnificent desert, that covers most of the Namib-Naukluft Park, is the oldest desert in the world. It is quite spectacular to climb dunes and walk on the cracked surface of Dead Vlei and know that it is estimated to be 20 million years old. Sun Safaris would recommend a visit to Sossusvlei as a part of any Namibia itinerary. The country is extremely contrasting and there is not another place on earth that will match a sight quite like this. 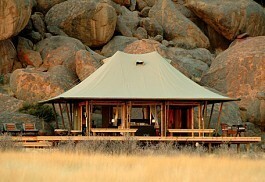 This is a remote and exclusive camp located approximately 45km south of Wolwedans. 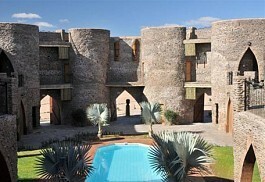 It is surrounded by enormous and spectacular granite rocks. 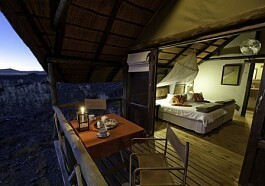 It provides a private and personal safari experience. 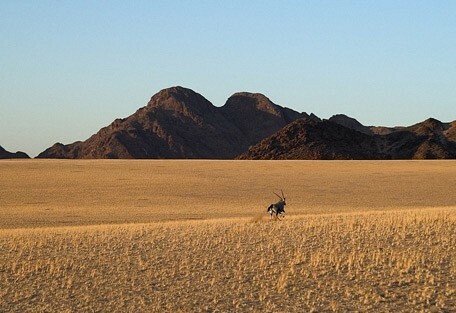 Activities explore the deep south of NamibRand Nature Reserve. This Lodge, in the Namib Naukluft National Park, offers luxurious and stylish accommodation from which to experience the remote beauty of the desert landscape. 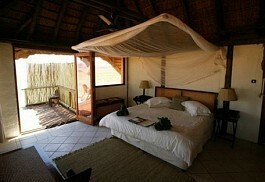 Each thatched 'kulala' has a rooftop sky-bed for romantic stargazing and both indoor and outdoor showers. This is an ideal setting for honeymooners or guests looking for a private and secluded hide-away. 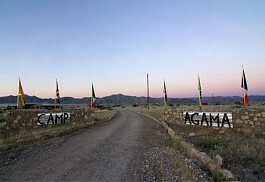 The open plan design of this camp offers sweeping views of the surrounding area. The area offers magnificent star-gazing and beautiful sunsets. This lodge captures the beauty of this extraordinary desert and offers peace and tranquility combined with exciting desert activities. Accommodation is stylish and complimentary to its landscape. Game drive activities available. Accommodated in luxurious and spacious stone and glass desert villas, guests can enjoy all aspects of the desert landscape; from the star-viewing windows abouve the beds, indoor and outdoor showers and daily walking tours and game drives in open 4x4 safari vehicles. 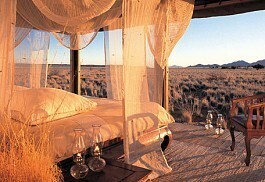 This camps is located in a site adjacent to the legendary and magnificent Sossusvlei Dunes. 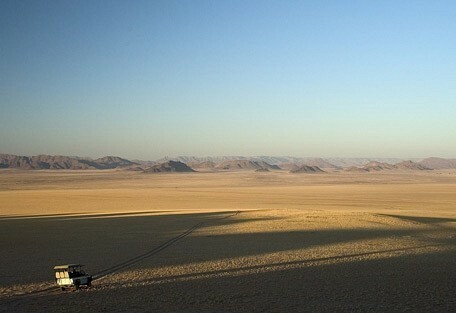 The camp offers breathtaking views of the surrounding Naukluft Mountains and organises exhilarating desert activities. This camp offers privacy and intimacy. The emphasis at Wolwedans Dune Camp is offering guests a personal and traditional desert experience form the bygone era. Its tents offer indoor and outdoor sleeping. Kulala Desert Lodge offers breathtaking views of the famous red sand dune of Sossusvlei, spectacular mountain scenery and vast open plains. Guests can explore the exclusive Kulala Wilderness Reserve and enjoy a fascinating hot air balloon safari. This lodge allows guests to enjoy the peace and tranquility of this spectacular location whilst being accommodated in spacious and luxurious rooms. 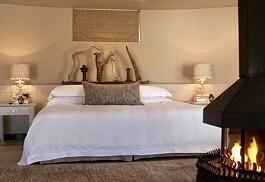 The lodge also offers all the services of a top quality spa and a variety of game viewing activities. 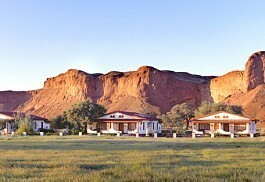 A small lodge with 16 comfortable guest rooms. 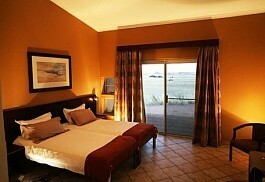 This is affordable accomodation from which to experience the Grianite Mountain and desert views of the Sossusvlei. Balloon safaris and senic flights are available from this location. The lodge offers comfortable accommodation, spectacular scenery and a variety of exciting desert activities, including dune drives. It is the ideal location for guests wanting to explore Sossusvlei, Sesriem and the surrounding areas. Situated 30km south of Solitaire and 50km north of Sesriem, approximately 45 minutes from the main gate way to Sossusvlei.Most visitors utilise our facilities as an overnight access point to Sossusvlei and the Namib Naukluft hiking trails. Wildlife found in the reserve includes gemsbok, mountain and plains zebra, springbok, red hartebeest, bat-eared fox and spotted hyena. The more rocky areas are inhabited by kudu, klipspringer, baboon and leopard, while the dunes harbour a rich and diverse micro-fauna. Animals, insects and plants have adapted to live in this harsh and arid region and get most of their water from sea mist that rolls up to100km inland. Snakes are common in the Namib, but few of the 20 species are ever seen. 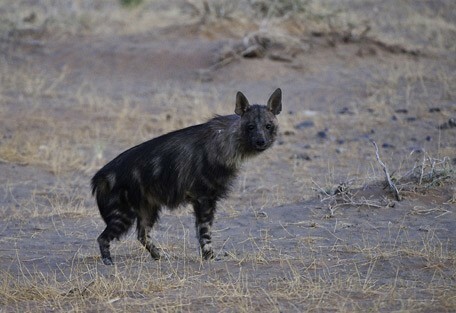 Spotted hyenas inhabit the Namib Naukluft Park, but are rarely seen, while black-backed jackals are more common. The Sandwich Lagoon is an important wetland of remarkable beauty, which attracts in the region of 200,000 birds. Flamingos constitute the largest percentage of water birds here and breed during the rainy season. The lagoon also supports several endangered Red Data species such as Chestnut-banded plover, white pelican and black-necked grebe. Guests at the lodges are welcome to explore the dunes on foot, traverse the reserve in a game drive vehicle, or book a hot-air balloon ride and catch the view of the rolling, red dunes from above. The wet, rainy season occurs during the months from November to April. These are the summer months and are characterised by rising temperatures, which during the day average out at between 25 and 35 degrees Celsius. During the night, temperatures fall to between 10 and 20 degrees Celsius. The rains peak in January and February, occuring in great bursts and can bring travel to a standstill. The winter or peak dry season occurs from June to September, when temperatures fall to a daytime average of 15°C to 25°C, and to a very cold night time average of 0°C to 10°C. 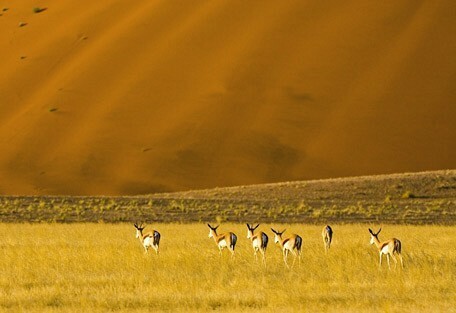 The best time to visit Sossusvlei is in autumn from March until May, or spring from August to October. The cool air offers clearer skies and ideal photography conditions and temperatures are milder both day and night. Kulala Wilderness Camp offers a private location in the exclusive Kulala Wilderness Reserve on the edge of the Namib-Naukluft Park. The lodge is small and has only 10 units with ensuite facilities and the option for sleep-outs under the stars in the middle of the desert. Sossusvlei Desert Lodge is secluded and romantic and offers a dramatic location close to the highest sand dunes in the world. The area promises breath-taking views and magnificent Namibian night skies. Little Kulala is a luxurious and unique desert experience; the ideal hide-away for honeymooners or guests looking a private and exclusive safari experience wanting to explore Namibia’s remarkable Sossusvlei sand dunes. 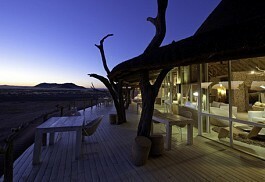 A very luxurious, yet environmentally concious lodge is Wolvedans Dunes Lodge. 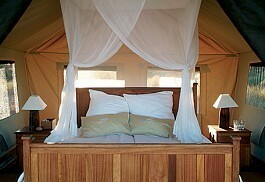 This tented lodge offers a peaceful experience in a stunning desert landscape and has received excellent reviews. Sossusvlei is an ancient desert area in the south west of Namibia, forming part of the Namib-Naukluft National Park. This is the southern end of the oldest desert in the world, the Namib. Guests visiting Namibia on a self-drive holiday can (and should!) 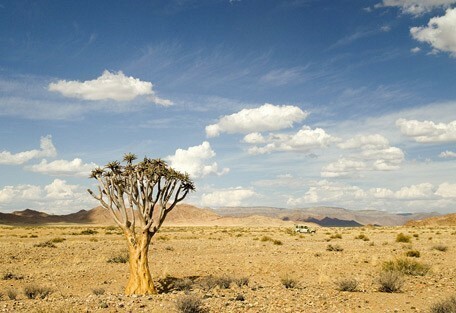 incorporate a drive to Sossusvlei. The drive from Windhoek will take the better part of a day and it is recommended that one use a 4WD, as there are some mountain passes that require a bit of manouvering. One will also need a permit to enter the Namib-Naukluft Park. 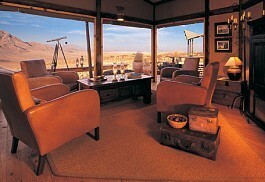 Alternatively, Sun Safaris can book guests in at one of the beautifully located lodges in the Sossusvlei area. It would be very beneficial for visitors to tour the area with one of the experienced guides, and the quick travel by flight will suit our guests' tailor-made itineraries. Sun Safaris will book guests on flights to Windhoek (Namibia's capital city and safari gateway), from where they will connect with scheduled flights to Sossusvlei. Guests will be collected from the local airstrip by their hosts and driven to their booked accommodation.